This species is accepted, and its native range is E. U.S.A., Mexico (Tamaulipas, San Luis Potosí). Erect or sprawling shrub up to 3–4 m. tall, sometimes with a definite cylindric trunk. Joints usually narrowly obovate, flattened, 10–30 cm. long, 5–12 cm. broad, bright green; areoles densely and shortly woolly; glochids brownish; spines 1–2 per areole (–12 on trunk), stout acicular, up to 7 (–10) cm. long, 1.5 mm. in diameter, one generally conspicuously longer than the other when present, greyish, dark-tipped. Leaves subulate, 2–3 mm. long, early deciduous. Flowers 5–7.5 cm. in diameter; outer perianth-segments yellow, striped or shaded red, inner golden yellow, widely spreading. Fruit obovoid, 5–7.5 cm. long, 2–4 cm. in diameter, glochidiate, spineless, reddish-purple, with edible pulp. 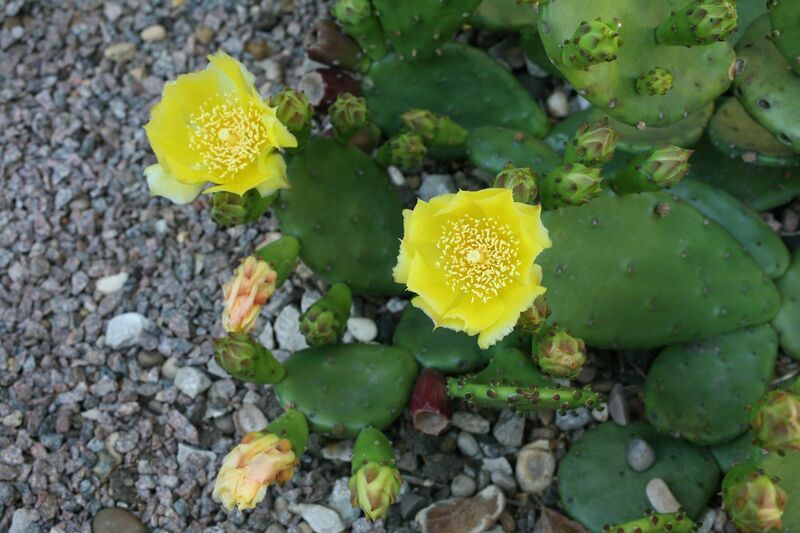 Bushland, coastal bluffs, roadsides; often planted to make fences; 0–1650 m.
Opuntia prostrata Monv. & Lem. ex C.F.Först. Saksonov, S.V. & al. (2014). Addition to the "synopsis of the flora of Eastern Europe vol. 1" (2012) in the middle Volga region and adjacent regions Botanicheskii Zhurnal. Moscow & Leningrad 99: 1067-1072. Tashev, A. (2012). Characteristics of the Opuntia humifusa (Cactaceae) locality in the Harmanli district, South Bulgaria Phytologia Balcanica 18: 11-16.